Iceland is a modern and liberal society with excellent facilities, healthcare provisions, low crime rate and a high general quality of life. It is is often ranked high in quality of life and happiness, and Icelanders are generally very welcoming, friendly and tolerant of other people regardless of race, sexual orientation or political or religious beliefs. 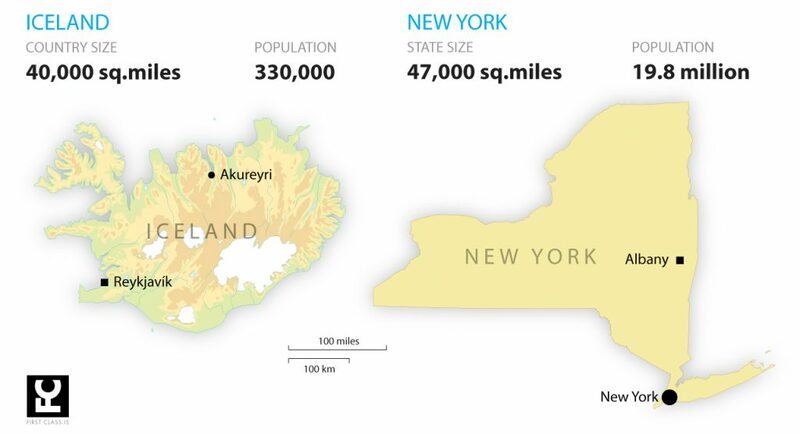 Population Iceland is in square miles almost the size of the state of New York. But the number of inhabitants in Iceland is less than 2% of the population in New York. Most Icelanders live in the capital area of and around Reykjavik. The highland interior is uninhabited (and uninhabitable), and most centers of population are situated on the coast. Language The national language of Iceland is Icelandic, a North Germanic language which has remained very much the same over the centuries due to the island’s historical and geographical isolation. Icelanders have an extremely high literacy rate and nearly all Icelanders, particularly under the age of 50, speak fluent English. Iceland was settled by Nordic people in the 9th century – tradition says that the first permanent settler was Ingólfur Arnarson, a Norwegian Viking who made his home where Reykjavík now stands. The Icelanders still speak the language of the Vikings, although modern Icelandic has undergone changes of pronunciation and, of course, of vocabulary! Names Iceland is alone in upholding another Norse tradition, i.e. the custom of using patronymics rather than surnames; and Icelander’s christian name is followed by his or her father’s name and the suffix -son or -dóttir, e.g. Guðrún Pétursdóttir (Guðrún, daughter of Pétur). Members of a family can therefore have many different “surnames”, which sometimes causes confusion to foreigners. History In 930, the Icelandic settlers founded one of the world´s first republican governments; the Old Commonwealth Age, described in the classic Icelandic Sagas, lasted until 1262, when Iceland lost its independence, and in 1944 the present republic was founded. Government Iceland is a parliamentary constitutional republic with an elected president as Head of State. The country is governed by the Althing (parliament), whose 63 members are elected every four years. Four-yearly elections are also held for the presidency; President Guðni Th. Jóhannesson was elected in June 2016 to succeed Ólafur Ragnar Grímsson. The Head of State plays no part in day-to-day politics. Currency The currency of Iceland is the Icelandic króna (ISK). Many restaurants, bars, tourist attractions will however commonly accept payment in US dollars and other currencies. Icelanders are also noted for paying for most goods and services by credit or debit card without a minimum spend fee. Tax free shopping Value Added Tax (VAT) can be refunded to non-residents of Iceland on certain items. Tax-free shopping applies to purchases of clothes, souvenirs and other gifts. This does not apply to food and drink, only products to be taken out of the country. VAT in Iceland is currently set at 24%. Time zone Iceland is on Greenwich Mean Time (GMT) all year round. Unlike most European countries, Daylight Saving Time is not observed in Iceland. A number of international airlines maintain regular scheduled flights to Iceland from both Europe and North-America. Icelandair has the most frequent and consistent schedule all year round and to various destinations. Charter flights are of course available for larger groups. Flight time from New York to Reykjavik is only 5-6 hours. Flight time from Europe is 3-4 hours. The international airport for Reykjavik is located in Keflavik. It has all modern facilities, variety of shops and restaurants and has been chosen the best airport in Europe. The airport is a 45 minutes drive from Reykjavik city center. All kinds of accommodation can be found in Iceland, except for five-star hotels, yet. We offer our incentive groups the very best four-star hotels in Iceland. Most are located in Reykjavik city center so that travelers can easily go for a walk around town and visit shops, bars, museums and cultural events. Iceland has emerged as one of Europe’s most dynamic gastronomic destinations, full of exciting places to taste thrilling new recipes. Chefs throughout Iceland use vegetables and herbs locally grown in geothermally heated greenhouses around the country, making sure you enjoy the best quality produce available. Iceland’s dairy products are also becoming famous for their wholesome flavor, especially the yogurt-like Skyr, now a big seller in Whole Foods stores in the US. Fish and lamb are traditional, but most restaurants will also include beef, poultry, pork, game, seabirds, lobster, shrimp and scallop on their menus, as well as vegetarian and vegan dishes. You will also find many specialist restaurants, such as Indian, Pakistani, Korean, Chinese, Thai, Filipino, Japanese, Italian, French, Spanish, Danish, American and Mexican. Two of the most popular sightseeing tours in Iceland are the Golden Circle tour and the South Coast tour. The Golden Circle tour is typically a day tour, in private buses or in private super jeeps, visiting the well-known Þingvellir, Geysir and Gullfoss with a variety of other options along the way. The South Coast tour is typically done in private super jeeps along the South Coast of Iceland and into the area of some of Iceland´s most famous volcanoes, including the infamous Eyjafjallajökull. Icelanders love to go outside to play, whether it is in freshly fallen snow, on a glacier, in swimming pools, on rivers and waters or through mud and rocks. Thanks to the fresh clean air and love of the forces of nature. We love when our guests come out to play with us. Some of the fun things to do are guided tours on super jeeps, ATV quad bikes, buggies, snowmobiles, Icelandic horses. We also love our heated outdoor swimming pools and hot tubs, where not so much swimming but a lot more playing, relaxing and socializing goes on. Reykjavik cultural scene is unusually rich, seeing that so few are living there. All year we have festivals and cultural events. Culture and sports play a large role in the life of an Icelander. We have popular annual festivals, such as music festivals Iceland Airwaves, Sonar Reykjavik and Secret Solstice, as well as Gay Pride Reykjavik, Culture Night Reykjavik, Reykjavik Marathon, Food and Fun, Design March and Reykjavik Fashion Festival among many. The nightlife is worth exploring on the weekends. Have a beer or two with the locals in one of the many bars in Reykjavik city center. And for those into shopping we have the typical shopping centers as well as Icelandic design boutiques. Specialized guides are of course available for shopping, nightlife, food, culture and more.